In Arizona, outdoor cooking means much more than a wheeled grill sitting on a patch of concrete. Arizonians like to entertain in their gardens. And, what is more inviting than a permanent cooking facility and eating area with generous counterspace and comfortable seating--- all surrounded by beautiful landscaping? For convenience, a fully stocked permanent kitchen can include a grill, firepit, sink, pizza oven, wok and refrigerator. While it might be placed near an interior entrance to the kitchen, eating areas often include shade trees or structures for sun protection, as well as a fireplace for enjoying cooler late evenings. With generous walkways, permanent lighting and well maintained areas, an outdoor entertainment area is an inviting oasis. Let Jeff's Landscaping & Yard Service assist you in setting the scene for your perfect outdoor living space. 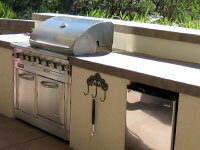 View some examples of outdoor kitchens we have installed. 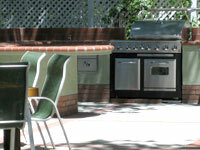 Would you like to enhance your backyard or patio with an outdoor kitchen? Call Jeff's Landscaping & Yard Service toll-free at (877) 820-0863 or Request a Quote directly from our website.